I finally got to see this movie, and I have been excited about it for the longest time. Ironically, I know, I was über sceptical about its predecessor, Rise of the Planet of the Apes, but after seeing it I was transformed into a fan, no to ways about it. 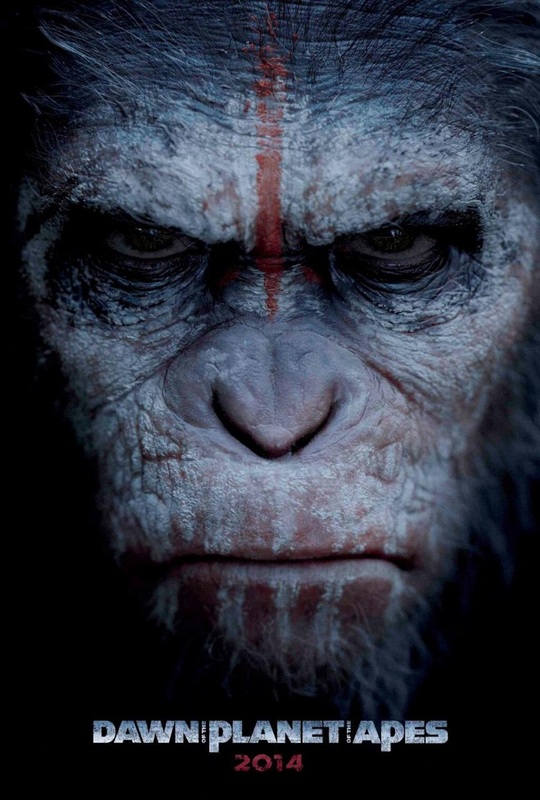 I couldn’t wait to see what was going to happen since Caesar led the apes away from imprisonment, into freedom. I wanted to know what would happen after that ALZ-113 spread, that virus that makes the apes exceptionally smart but kills off the people. Let me tell you, the watch was well worth the wait. The effects were simply amazing for this film, the CGI was something else. It was just gorgeous. The portrayals, too, were phenomenal, and Andy Serkis again simply owned the show in his role of Caesar. Again, the friendship between him and Maurice is so cool, they are such great friends. Caesar and the apes truly did build their little piece of happiness, their own home, settling into regular roles, very humanlike. Koba was a brilliant character, and his hatred and motivations are completely understandable, even though they are totally opposite from Caesar, whom we can also understand on the other end. It shows that each and every experience is subjective. Jason Clarke was great as Malcolm, though I must admit I was disappointed by how small a role Gary Oldman actually helmed at the end of the day. The movie also managed to balance some complex and dramatic material, but also had a few things to smile at and laugh about throughout the film, which lightened it from time to time. The relationships and how they change between the humans and one another, the apes and one another, and then both groups towards each other is quite something. I feel that Dawn of the Planet of the Apes gave a good look at both the humans and the apes, and both their sides and their feelings. They each had nice characters, and both had nasty characters, so no party was purely innocent or completely wrong, and it is bad to see what some people will do with some power. The emotions that were put forth were complex, delving into many different aspects, from the humans side as well as the apes, and you can identify with both sides, though there is no doubt that the perception is almost skewed more in favour of the apes. Koba’s character was extensively used, and properly so. The movie was shot well and beautiful to look at. The scenes were the apes go to war, ultimately, captured the essence of confusion and fear perfectly. This movie was excellent, and well worth the praise it receives, it came together wonderfully. This entry was posted in Movies and tagged action, Andy Serkis, Dawn of the Planet of the Apes, excellent, Gary Oldman, great, Jason Clarke, Matt Reeves, movie reviews, movies, Planet of the Apes, solid. Bookmark the permalink. You know what? After watching Lawless yesterday and seeing Howard in your picture up there… I miiiiiiiiiiiiiiiiiiiiiiiiiiiiiiiiiiiiiiiiiiiight give this a watch when it comes out on the TV. Bwahahahaha you totally should, Jason Clarke is a good actor, under-appreciated. Wasn’t he just fantastic as Howard?! ABSOLUTELY he was!! Loved it!! That still makes me more happy than you can understand! They do look amazing! And Maurice rocks! 🙂 Thanks Tim! There really was so much to love in this film, and it was visually arresting! Toby Kebbell…that is all…oh, and Jason Clarke! 😀 Agreed! Fantastic work from them! Thank you kindest. They are well worth the watch, I mean I was surprised how much I enjoyed the first, so I was sure the second one would deliver. I was not disappointed. Just seen it and loved it. Great piece. 😀 I am so happy to hear that, and thank you! A very good sequel that actually expands upon the universe and shows that it can literally go anywhere now. Good review Zoe. Thank you. Crossing everything, you have to see this one, and in cinema it is just amazing! I’m really glad you enjoyed this as much as I did. Great review! I actually got mad at a good friend of mine for saying that this movie was disappointing. It made me question his intelligence. I like the apes in this movie better. Thank you, it was truly excellent. Great review this is on my to-do list for sure. Even more so knowing that all my fave peeps liked it. 😀 I think you will like it! It was extremely well done! Woo hoo!! Glad you’re now a fan Zoe!! I felt the same way about the first film too, I never saw the original Apes movies so I wasn’t really that enthused about it. But then I saw ‘Rise’ and was really intrigued. I LOVE this one, I think it expanded the story and made it even more intense as well as emotional. It leaves a lasting impression, more so than say, Guardians of the Galaxy. I mean it’s a fun movie but probably not gonna stick w/ me as long as this one does. 🙂 Yessss! Great show to see that this franchise came back with such a kick! Yes, this movie does linger after all is said and done. It was complex and visually stunning, littered with solid performances all round! I am really not interested in Guardians of the Galaxy, to be honest. I hear ya, you’ve gotten superhero fatigue as well I take it? I think it’s worth a watch but it’s perfectly ok to see later on rental too. It’s frivolous good fun, that’s about it. No, not really fatigue per se, but last time Marvel had such a hyped up release, it was The Avengers, and I am not a fan at all.